Do you want to add extra fields to your campaign form? It’s easy with our Custom HTML integration option. Follow our guide below to add extra fields to your campaign, such as a company name or a hidden field for list segmentation. Will I be able to use the Success Message or Redirect URL settings I’ve configured for my campaign with a custom form? Create a new campaign or modify an existing campaign from OptinMonster Dashboard. Open the OptinMonster Builder by selecting the Edit button. Select the Integrations tab in the campaign builder. Make sure there is only one integration and edit it. Next, choose Custom HTML from the Email Provider dropdown. Log in to your Email Service Provider account (Mailchimp, AWeber, IntegrationSoft, etc) and create your campaign form including the additional fields you want. 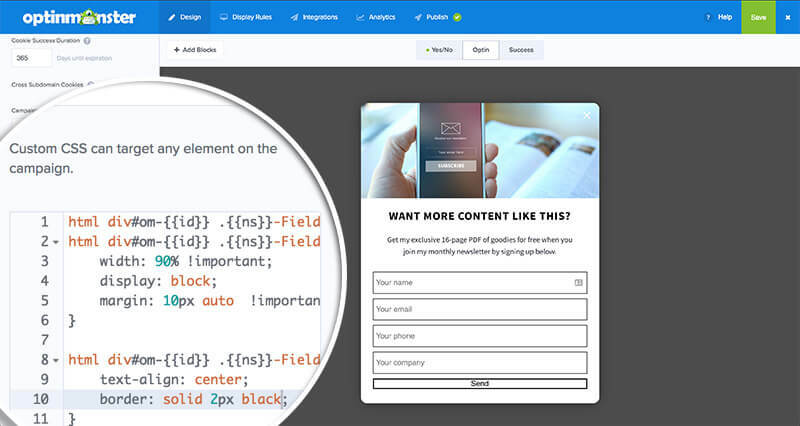 Copy & paste the HTML form code provided by your Email Service Provider into the Custom HTML Form Code field in the Integrations panel of the campaign builder. Want more details on using the Custom HTML Optin Form integration option? 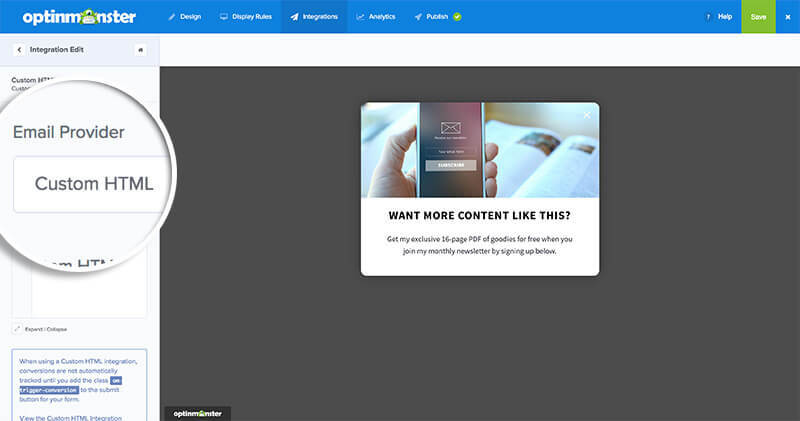 See our guide on how to connect OptinMonster with any Custom HTML form. The pasted HTML form may not adhere to the default styling of the optin theme you’ve selected, so it may be necessary for you to add some custom CSS before your form can appear as expected. Select the Design tab in the campaign builder, and go to the Display Settings panel. Scroll down to the Custom CSS box. Here you can add Custom CSS styling as you require. Be sure to save your campaign and you’ve successfully added extra fields to your campaign! Need to track conversions with your custom HTML form? See our doc on how to track conversions with a custom HTML form. Q: Will I be able to use the Success Message or Redirect URL settings I’ve configured for my campaign with a custom form? A: No, unfortunately it’s not possible for OptinMonster to override your custom form’s default actions. You’ll need to control the URL the visitor is redirected to after submitting the form through your Email Service Provider account.